They say that weddings in Greece prove to be especially lucky because they are blessed by the spirit of the ancient gods. Island weddings in particular are an amazing experience as they reflect the warmth of the sun and the openness of the blue sea. But if you go for the real magic, for the absolutely perfect, glamorous yet so chic scenery that mystifies artists and movie makers from all over the world, for the never sleeping top destination of celebrities, then you have but one choice: to plan your wedding in Mykonos and prepare yourself for the absolute bliss! 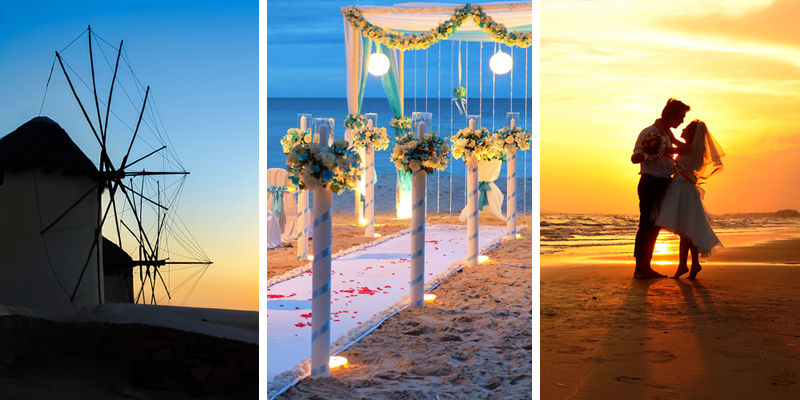 If you wish for a romantic wedding, with you walking barefoot down the sandy path that leads to the candle-lit beach, just have your dream come true. The island is full of fairytale like beach bars and restaurants from where you and your guests will experience the world-famous Mykonos sunset, while enjoying delicious food under the sounds of live music. For a more luxurious wedding you can pick a dreamlike venue and dance away the most beautiful night of your life by the decorated with rose petals swimming pool. You can have a jet-set wedding event with full butler services in the privacy of your veranda or on the deck of an exclusive rented yacht. All you have to do is set your imagination free to create what will be the most unforgettable memory of your life from Mykonos, the sensational “weddings’ paradise”. So just say yes and leave the rest to one of the expert wedding planners who are ready to make your dream come true, by taking care of every detail; from the paperwork to the whole styling of the event, the accommodation of your guests and any other extravagance that will make you the happiest newlyweds ever!